A rock musician on the brink, his drunken father and the grieving widow of a murder victim. 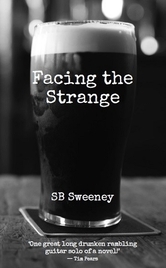 Facing the Strange is a tale of three lives in free-fall at the end of the analogue age – the lives of three characters that hold the key to one another's redemption. All that matters right now is to stay awake long enough to piece together the last few joins and run the film. You pause to shake a handful of ephedrines out of a plastic tub and then you swallow them dry, one after the other. Although you’ve started the Tullamore Dew Jessie bought for Christmas, it seems a waste to use it as a pill chaser. You still retain a sense of appreciation, even if you have let go of pretty much everything else. The task at hand is to piece together a box full of Super 8 films into one feature length reel – and it’s almost finished. You have been working on it since getting back from walking the dogs this morning. The idea is to watch all of them in one go without having to change the little reels over. You have watched the older ones in the box, time and again. The action looks jerky but it’s difficult to say whether that was down to the wear and tear on the film, or the projector, or maybe it was just the way people moved back in those days. At least when a hand held cine camera was pointed at them. The main characters, of course, you know well. There’s Tom, six feet tall and built like the type of athlete who trains too little and enjoys life too much. Usually he’ll be well turned out with salt and pepper hair in a duck’s arse style, as was fashionable in the late 50s. And then there’s Angela, who looks like Jackie Kennedy in her pencil skirts and round topped, short-brimmed hats. She smiles and poses as if she was born to be a leading lady. The camera once belonged to them. They would carry it around in a double zipped leather case. It was their diary, of a sort, and they had used it well. Then the camera was passed down to you, and the films switch location to mainly in and around the house in Bush Road. They become populated with different characters: Jessie, Frank, Monica and the band. You’ve spliced together the whole box of reels in a random order, as each one has come to hand. Right now you want to watch it all, old and recent, in no particular sequence. You’re holed up in the kitchen of a stone end-terrace on the moors of West Yorkshire. Its one conventional source of heat is an ill fitted pot-belly stove, which produces more in blinding smoke than warmth. So the oven has been left alight for two hours in an attempt to take the edge off the chill, you are layered in jumpers and the room is choked. You have two dogs for company and Jessie should have reached London days ago. She, no doubt, is having a wild time. You complete the final join on the reel and having fixed it to the spindle, you set your work in motion. After gobbing some downers, that is – to take the edge off the ephedrines. Outside, more snow is falling and the temperature has dropped well below freezing. It would most likely result in a treacherous surface for walking, which rules out making a phone call for the time being. You feel as though you might need to, at some point, but your nearest phone-box is at least a hundred steep yards down onto the valley road. Why struggle in those conditions when you have other options? Why expose what little warmth there is in the kitchen to the frozen winds? The house creaks and groans as if to confirm your thinking. You wonder what Tom would make of the state you’re in. What would he do in your shoes? This Super 8 star who hauled himself up from a poor background to live a reckless and rangy life – surely he’d shrug his shoulders and dismiss it. He’d laugh at the shambles you’ve made of things. You study him and Angela as they flicker across the wall, large and bright, on a carefree, drunken drive through the north country. And then it switches to a long panning shot across Ullswater, with a breeze rippling the lake – and now they’re inside a pub. Would things seem this bad if you were there with them, sitting at the bar amongst those old locals, chorusing along with their songs? You have seen many pubs in these films. You’ve seen them as grainy, jumping, shadowy places. They are filled with marbled cigarette smoke, occasionally seared by the projector bulb through sections of worn film. Everyone smiles, raising their glasses to the camera, wearing woollen jackets and cardigans, and Tom is always in sunglasses. Life, as you have watched it, was not only a party, it was suffused with certainty. You are in the some of the older films too – the little lad in a football jersey, rubbing his eyes with his wrists. And this unsettles you. You have peered at that lad, leaning forward in your seat. You have rewound and watched him again, yet it’s still like watching a stranger. You recognise the face and the mannerisms, but in the end little Danny Boy is just another character up there, separated from the viewer, so your memory, like the wall, becomes a screen.